I can now take credit cards! I hope that this will bring in new sales as I try my hand at various shows and festivals, and I will be able to take credit cards during my home sales. I can also take credit cards over the phone if you see anything in the blog that you wish to purchase. Charge!!!!! Freshwater Pearl Earrings - $10 each All have been SOLD. I love making earrings - that is why I have so many for you to choose from! Here are a few in gold. All are $8 each. (The first one says $10, but it is now only $8!) All have been SOLD. Freshwater pearls are mixed with squares of green jasper and a jasper teardrop. Gold plated accents. Necklace $35 and earrings $8 each. All have been SOLD. All closed up. It even has an awning and place for a banner across the top. It was a snap to put up. We will practice a few more times so we can do it quickly. Testing out table layout. I think this is the design I will use. There will be some shelves on the tables to add height as well as some earring stands. And I will pick out a couple of pieces of cloth to soften things. Mike expanded on my idea to hang the shutters. This is so easy to assemble and versatile. Today I took an inventory of my wares. A necessary evil! :) I have also been busy sorting through pictures and making sure they all have labels. I also need to note which have been sold as quite a few things have been sold this summer. Keep checking on the links to photos on the right as I update the source. I also received my new tent yesterday - time to try and set it up and then figure out a display for the inside in preparation for my first booth on October 3rd. Beading is more fun, but these are things that have to get done! 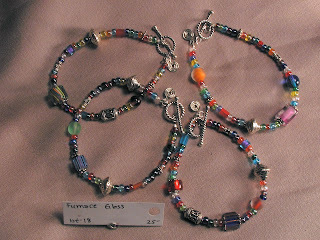 Furnace glass bracelets have been one of my most popular bracelet styles. Each one is unique, made with a mixture of assorted glass beads and silver accents. I often wear one as they go with just about anything. Easy and fun to wear and affordable too! All have been SOLD. Amethyst chips with iolite accents. Necklace $45 and earrings $10. All have been SOLD. Amethyst is given as a symbol of sincerity, security, and peace of mind. It is also thought to magnify psychic abilities and right-brain activity, energize and purify the blood, relieve headaches, improve blood sugar imbalance and strengthen immunity. Iolite is known as the Vikings compass due to it's ability to determine the direction of the sun on overcast days. When the legendary Viking mariners sailed the wide ocean, they used thin pieces of iolite as the world's first polarizing filter. Looking through an iolite lens, they could determine the exact position of the sun, and navigate safely. Whew - a whirlwind month of touring around the country. Now I am home catching up on life's little details. Time to restock and get ready for my next sale. While in MN I discovered that one of the findings I have used in the past has been failing. So I took several items back to WA to remake. I guarantee all of my work so if you ever have any problems with any of my designs please let me know. I appreciate the feedback as it allows me to improve upon my future designs. I will fix, remake or replace any piece that fails or causes an issue. Just let me know and I will address it, usually at no charge. I want you to enjoy wearing my designs! And there is also my Orphan Earring Guarantee: Do you have orphans looking for a new partner? Send them my way and I will repair, re-make or replace. There is usually no cost. Of course if I start receiving lots of baggies full or orphans in the mail I may have to re-think that!